Fighting has erupted just outside Slavyansk, a town in east Ukraine where population voiced their protest against Kiev authorities. 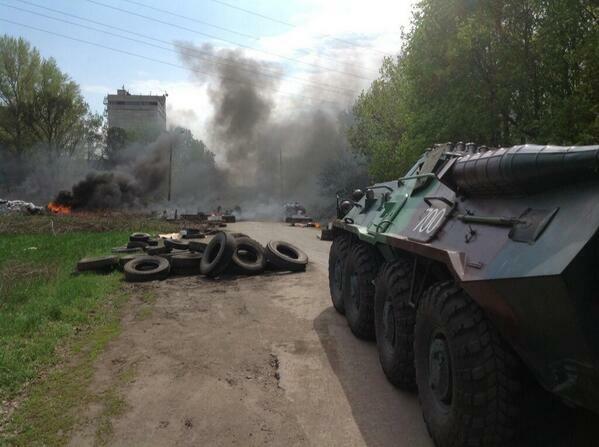 Ukrainian troops on tanks and armored vehicles are trying to break into the town. According to Ukrainian Interior ministry, at least five self-defense guards have been killed and one policeman injured after the ‘antiterrorist operation’ launched by Kiev in the city. Three checkpoints erected by the anti-government protesters have also been destroyed. Witnesses report on Twitter lavyansk self-defense forces are now burning tires to hamper the entrance of infantry vehicles from Kiev into the city.